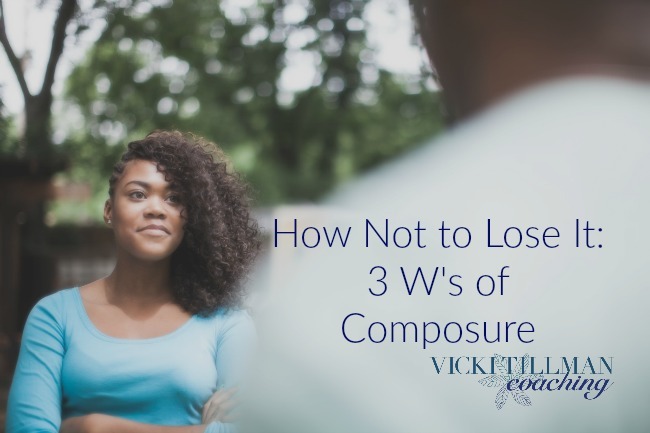 Here’s how not to lose it: 3 W’s of Composure. Ever noticed that every time you lose it, no one remembers WHY you lost it? They only remember that you’re the kind of person who loses it. The problem with losing it is that…you lose it- your power, your influence. You start out with good composure then the person you are dealing with does or says something or simply marginalizes your input. It’s just too hard. You start to steam. Fight or flight kicks in. So you fight or flee. So how do you maintain composure? Train yourself well on the 3 W’s. What am I feeling? Train yourself to quickly assess what you’re feeling. That may sound irritating and slow, but think about it. When you explode, meltdown, lose it you’re not really aware of what you’re feeling. You’re simply gut reacting. Take control. Ask yourself: What am I feeling? What am I going to do about it? This is the important one. Make a decision. The minute you make a decision, if it is a rational decision, your neural activity switches from the fight-or-flight area of the brain to the frontal lobe of your brain. That’s the part of the brain where you are smart, strong and savvy. While it may take a while to restore calm inside, your demeanor will look more like composure. This keeps you in a place of grace and power. Of course, the 3 W’s are difficult to manage if you are experiencing HALT. The folks from AA learned this years ago: If you are Hungry, Angry, Lonely, Tired, it is darned hard to be rational. That means whenever possible, as much as you have control over it: Don’t go into a tense situation before mealtime, when you’re already irritated, when you are feeling rejected, or you slept dismally last night. If you don’t have control over your condition, keep breathing and keep plugging through the 3 W’s. Keep your composure! It helps to practice mindfulness of some kind. My 2 favorite mindful activities are Progressive Relaxation and the Ignatian Examen. When you’re ready for some coaching to help keep you in an empowered-communication place, contact me. Career Exploration was a tremendously empowering experience for my teens and young adults. 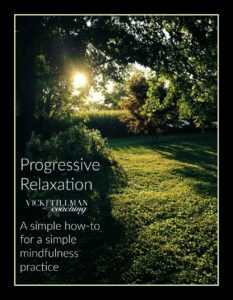 Three of my children worked through Vicki Tillman’s Career Exploration Workbook while they were high school students and learned so much about what types of steps they were best suited to take following graduation. My older son had missed out on the course as a teen and went back to use the workbook as a twenty-something when faced with the need for a job change; he was delighted with the direction he found after working through the exercises. I cannot recommend this resource too highly! Every teen and young adult will find greater understanding of their unique gifts and interests and how those qualities can influence career choices for a fulfilling future in the work world.